It was cold, and it went extra innings. But in the end two of the hottest Buckeyes made it a home opener that the brave that stayed won’t soon forget. COLUMBUS — It was Ohio State’s home opener, but it revealed much of what this team is about and what it has worked for and toward in it’s first 17 games, in fact, going all the way back to Fall Ball and further. They Buckeyes may not beat you to death, but they sure as hell will wear you down. 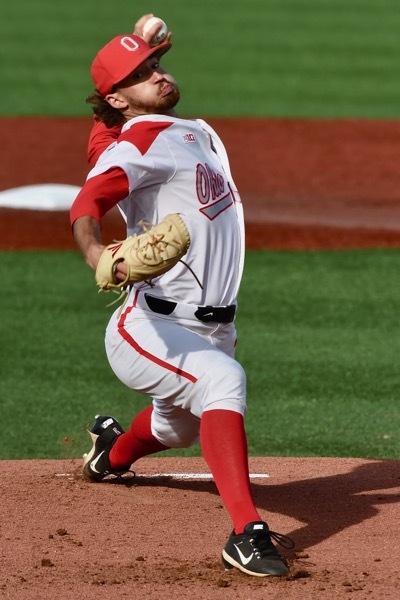 Ohio State defeated CSUN (Cal State Northridge) 2-1 Friday night at Bill Davis Stadium, but this was a game when the score said very little about the game—other than the fact that the pitching, from start to finish, was very solid. This game took three hours and 32 minutes to play. It required 12 innings and nine pitchers. It was filled with one counter –punch after another, and it ended in dramatic fashion. With men at first and second – Nate Romans at second and Bo Coolen at first – Dom Canzone poked a two-strike pitch to short left. It fell in front of Alex Hull, who was drawn in on the play. Romans was running all the way. Hull fielded the ball cleanly and delivered a solid throw to the plate just inside the third base line..
Romans slid to the right of the plate, missing Trevor Casanova’s tag and getting his hand on the plate. But it was Canzone who delivered. The game-winning hit, his fifth hit in six at-bats. 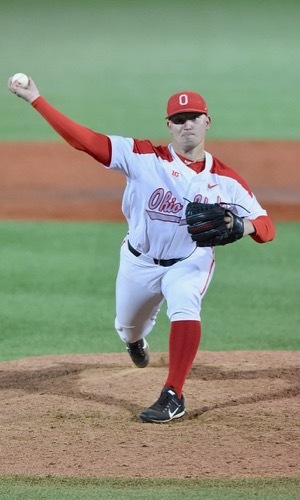 Phoenix Bats, an Ohio company, is proud to support Ohio State baseball on Press Pros Magazine.com. Starter Connor Curlis was at his best, pitching 3-hit baseball into the seventh. If Canzone is not impressed with his own efforts, everyone else is. Kinker, now 3-1, entered the game in the eighth, runners at first and second and one out, following Michalik. Starter Connor Curlis was strong. He worked 6.1 innings. He gave up one run on three hits. He struck out eight and didn’t walk a soul. He allowed a lead-off single to start the seventh and Albee Weiss followed with a double to deep center that was layed particularly well. A sac bunt moved Weiss to third and, at that point, Beals called on Michalik. He got the second out of the inning on a ground ball to first. The final out came on a routine grounder to short. Seth Kinker pitched the last 4.2 innings of shutout baseball to record the win. Kinker’s shot came the next inning, but the beauty of this game was the match play. Each move by each team was countered. Much of that was due to Seth Kinker. There is nothing fancy about Kinker. He comes out. He comes at you. He throws strikes. Friday night Beals put all his chips on the senior right-hander. The question became how long can they go with him? There was no taking him out of the game Friday night. The thought wasn’t there. “You may have had to get security down here if I tried to take the ball away from him,” Beals said. “How far can I go with him? Tonight, I’m reading flow. I’m reading the game and I’m looking at him and he is shaking his head. No way he is coming out of the game. This was a game about detail, the little things, and a case when the little things did make the difference. The details and something else that has evidenced itself early this season, something that shone brightly on a chilly night at Bill Davis stadium. “We won today with that competitive nature from guys like Canzone, (Seth) Kinker and let’s not forget (Kyle) Michalik,” Beals said. 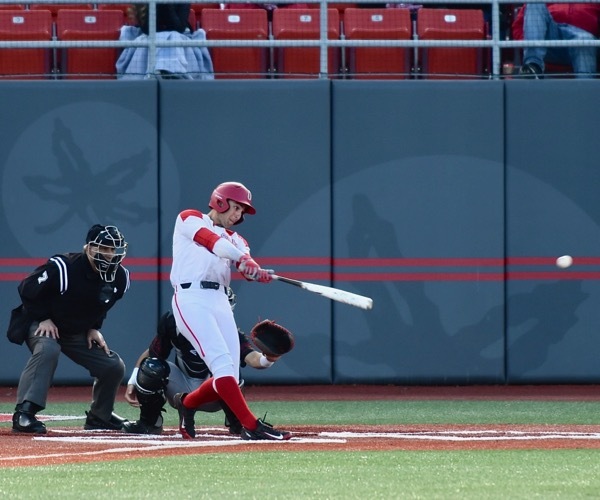 There are still issues—defense—the Buckeyes committed three errors, all in the infield. But this was not a night to talk about things of that nature. Tyler Cowles and Dominic Canzone celebrate the Buckeyes’ walk-off win in the 12th. 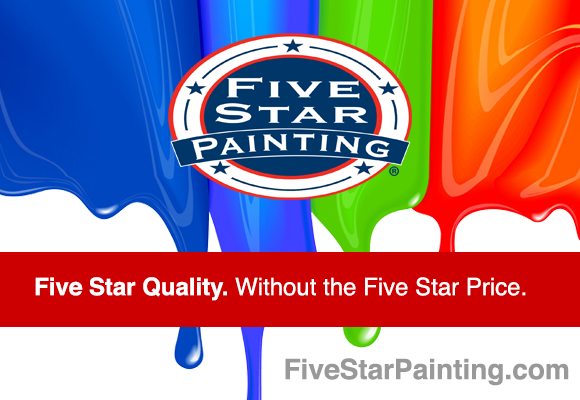 Five Star Painting, in Pickerington, Ohio, is proud to sponsor the Buckeyes on Press Pros Magazine.com.